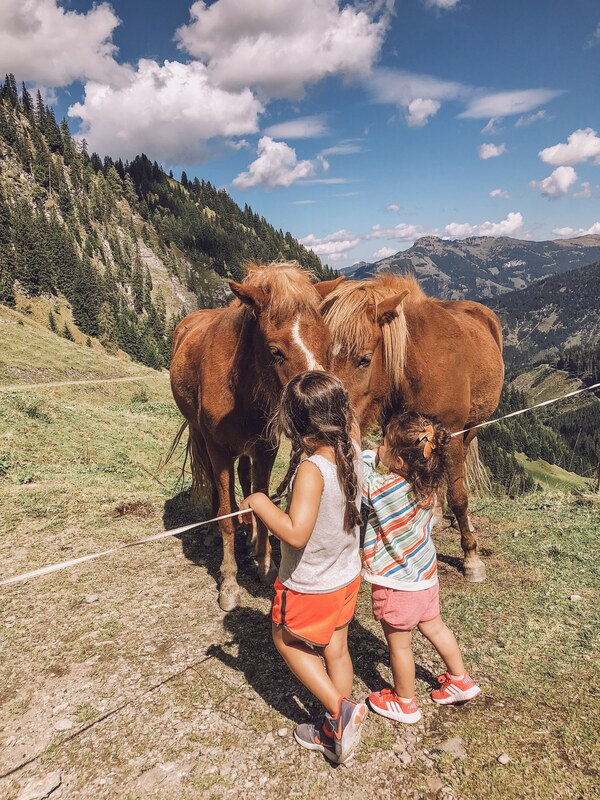 TRAVEL | Austria with Kids, How Much It Cost & Our Itinerary - Lynzy & Co.
It’s been a long time coming but I am finally able to bring you today’s post on traveling to Austria with kids! I decided to break down our most recent trip into two blog posts, each one focusing on each country, I didn’t want the content to be too overwhelming. If you want to check out our Switzerland part of the trip, you can head HERE! I also attached this amazing PDF magazine that shows you all the different places we ate at, things we did, and how I packed (with my favorite essentials). You can click below to pull up the magazine in a new window or simply browse it here right on my blog! or just scroll through it below! I had so many requests for me to put together our entire itinerary and break down the cost of our trip so I did that for you in today’s post. You can easily click on the itinerary image below to print it out for yourself or just click here to print! Our car ride from Wengen to Grossarl, Austria was approximately 11 hours with stops & major traffic when we went through Munich, Germany. To be honest though, even with a tiny car and three kids – we survived to talk about it and it wasn’t that bad – PERSPECTIVE 😉 You’ve got this. Grossarl was unbelievably quaint and beautiful. It’s about an hour outside Salzburg and it was our first stop because we we’re staying at Moar Gut. Moar Gut is HANDS DOWN one of the most beautiful hotels I have ever been to and they catered to our family so well. I could not recommend something MORE than I recommend planning a trip to Moar Gut. I can 100% say that you will LOVE it and your kids will too. Moar Gut has farm animals that the kids can play with – goats, lambs, chicks, rabbits, horses and more! They also have a phone system that you use when your kids are napping. You can go sit at the pool and you can hear inside your hotel room! The resort is small and intimate so it would only take you a minute to get to your room if you needed to! They have so many activities and things for kids to do including the most beautiful kids play area I have ever seen. They bring the kids outside for games and they have planned family activities every day. One of the days we went on a hike with other families from the resort and had lunch at the top – it was BEAUTIFUL. They were kind enough to give me a coupon code: lynzy_moargut for you to use for a 50 Euro voucher to the spa if you end up going for 3+ nights! This picture was from the top of our hike – wild horses met us! We took a day trip to Halstatt while we were still in Grossarl and I have to say that even though it’s stunningly beautiful, it was WAY TOO OVERCROWDED. I have heard that it’s way better in winter but holy smokes, you cannot even walk. I won’t even mention the amount of people trying to take pictures of my kids (it was very unnerving). So if you aren’t able to visit in winter, I wouldn’t recommend it honestly. There are plenty other beautiful areas! Salzburg is a BEAUTIFUL city full of life. For a family with young kids though, I recommend going anywhere else. It’s hard for the kids to run around when there is traffic everywhere. We took a day trip to Lake Fuschl and HOLY SMOKES. I wish we had stayed the last 4 days there instead of Salzburg! As for trip cost, you can imagine, this is something you will probably need to save for. Especially if you plan to stay >10 days! You can always reduce the cost by staying a few days less than we did. Also, the last hotel we stopped at was comped for us but very expensive, so keep that in mind when you see the breakdown! We also went for 5 seats so that Miles would be comfortable on the long flight. If you don’t have three kids, then you save money there too! Moar Gut Resort x 5 nights (all inclusive) $3,275 (rates can very much vary depending on room. Can be much less) This was comped for us. Now, I get it. Not everyone is going to want to save that much money to take a 2 week trip with their family but THIS is a huge priority for us as a family. It was an unforgettable trip that I think about daily and the kids bring up all the time. We made so many memories there that I will never forget and that’s what it’s all about. Discovering new cultures, making memories and breaking free from our normal routine. If you do decide to go on a similar trip, I would absolutely LOVE to hear about it! Hi! Thank you for posting this. I love the idea of doing a trip to switzerland, but also feel like moar gut looks unbelievable! i think we will have 8-10 days for our vacation. would it be crazy to do these two things together in our trip, or should we try and plan to seperate vacations.. one to switzerland, and come back for a longer stay at moar guit another time? thank you! &COPY; 2019 Lynzy & Co.. All Rights Reserved.